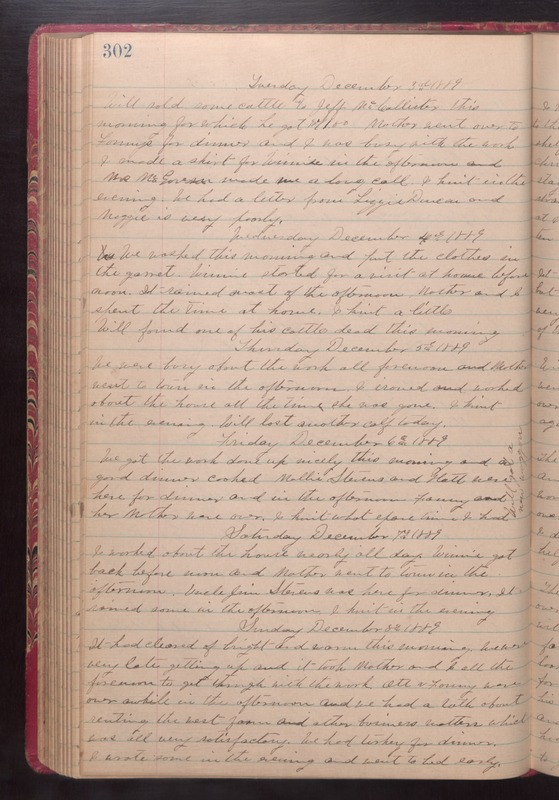 Tuesday December 3rd 1889 Will sold some cattle to Jeff McCallister this morning for which he got $71.00. Mother went over to Fanny's for dinner and I was busy with the work. I made a shirt for Winnie in the afternboon and Mrs McGovern made me a long call. I knit in the evening. We had a letter from Lizzine Duncan and Maggie is very poorly. Wednesday December 4th 1889 We washed this morning and put the clothes in the garrett. Winnie started for a visit at home before noon. It rained most of the afternoon. Mother and I spent the time at home. I knit a little. Will found one of his cattle dead this morning. Thursday December 5th 1889 We were busy about the work all forenoon and Mother went to town in the afternoon. I ironed and worked about the house all the time she was gone. I knit in the evening. Will lost another calf today. Friday December 6th 1889 We got the work done up nicely this morning and a good dinner cooked. Mollie Stevens and Hatt were here for dinner and in the afternoon Fanny and her Mother were over. I knit what time I had. Will got a new waggon. Saturday December 7th 1889 I worked about the house nearly all day. Winnie got back before noon and Mother went to town in the afternoon. Uncle Jim Stevens here for dinner. It rained some in the afternoon. I knit in the evening. Sunday December 8th 1889 It had cleared of bright and warm this morning. We were late getting up and it took Mother and I all the forenoon to get throught with the work. Ott and Fanny were over awhile in the afternoon and we had a talk about renting the west farm and other business matters which weas all very satisfactory. We had turkey for dinner. I wrote some in the evening and went to bed early.